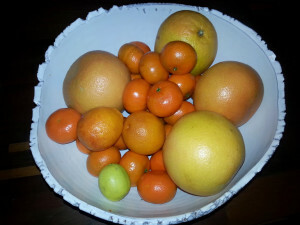 That’s a picture of my fruit bowl this week, actually, my half eaten fruit bowl. It’s filled with twenty cent grapefruit, sweet clementines, my favorite Italian treat–blood oranges, and a fresh lime from our indoor tree. The abundance of fresh citrus fruit is one of my favorite things about winter, a season that’s a little gloomy this year, even in Colorado. Well, it turns out my love of grapefruit and all things citrus may actually be good for my running. Citrus fruits, as well as tropical fruits, are packed full of vitamin C. A vitamin that performs several important functions for runners. Vitamin C is necessary for the formation of connective tissues like cartilage, tendon, bone and skin. Unfortunately, many runners are familiar with injuries to connective tissues like runners’ knee, IT-band pain and stress fractures. Vitamin C is vital to the healing process and overall joint health. Vitamin C plays a role in the production of hormones and neurotransmitters secreted during exercises. Neurotransmitters like norepinephrines stimulate the heart, blood vessels and sweat glands during exercise. Like the runner’s high? They’re responsible for that euphoric feeling too! Vitamin C is a powerful antioxidant. It may reduce the the symptoms and duration of upper respiratory tract infections, more likely to occur after strenuous physical activities like running. Stay healthier and prevent disruptions to your training by eating foods high in vitamin C to prevent illness. Vitamin C helps with the absorption of iron. Many runners struggle with Anemia or low iron levels which can cause fatigue and negatively impact performance. Consuming vitamin C with non-heme iron rich foods or supplements enhances the absorption of iron. While vitamin C has lots of health benefits, contrary to popular belief, it can’t actually cure the common cold. What’s your favorite thing about winter–running related, or not? Winter Running: Brr, it’s cold outside!